Blueface hit song “Thotiana” has engaged number of remix from different peer in Hip-Hop of which Nicki Minaj is one of them. 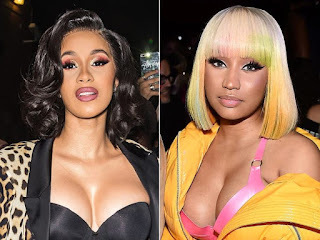 If you are missing Nicki Minaj “Thotiana” remix then you need to weigh in to compare the official remix from Blueface Feat Cardi on same “Thotiana”. At least Cardi has flow on on own Structure of lyrics which Nicki Minaj done that already before Blueface turn up the official remix with Cardi b. However, blue face seem judging the whole remix from different perspectives and then address Cardi b as the Queen of rap who murder Thotiana song. Blueface manager, Wack 100 points that Cardi is kiil the song. Wack 100 is one of Nicki Minaj odd and he never like the young money rapper for once.